MoodClue is the new must-have item for tweens and teens. Developed by a former UVA cheerleader, it is an empowering, positive messaging tool for girls that gets them off their phones and back to using their creativity. I made it quote shaped so that girls would know that their voices are important. I encourage girls to use it for positive inclusive messaging. This is not a product for mean girls. Lauren Wilmot, 24, is the CEO of a new company called MoodClue. "I always knew I would start a business because I've been working almost all my life. When I was kid, my mom quit her job at CitiGroup and started a company. For the next 10½ years, until she sold it, I spent my summers and school vacations working at the business doing everything from sweeping floors to talking to customers to writing procedure manuals. I had my first corporate credit card when I was 11 so I could ride my bike to the post office to buy stamps to send out brochures. When I started this business, I asked my mom to work with me as I know we make a good team." "MoodClue is a writable/erasable quote-shaped hangtag with matching carabiner for backpacks, gym bags, purses or briefcases. The MoodClue hangtag can be written on and erased repeatedly without ghosting nor deteriorating. It's a brand new, patent-pending, type of writing surface, perfect for liquid chalk markers or any other erasable marker." "I made it quote shaped so that the users would know that their words/drawings/voices are "quotable" and important. I encourage girls to use it to write positive inclusive messaging. This is not a product for mean girls. 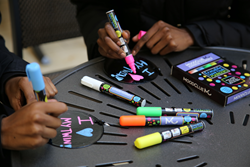 The hangtag comes in 6 bold colors and each hangtag comes with 6 neon markers. We believe that girls who use this product will develop into amazingly fierce, positive adults who aren't afraid to speak up and speak out. We are helping girls find their voice and publicly express themselves in a positive way." "As an added benefit, when we tested the product with our target market, we found that kids put down and ignored their phones. Something about our bright neon markers seems to encourage imagination. We were amazed at the creativity shown. One group even starting playing tic-tac-toe and hangman," added Wilmot. "While we were running focus groups of kids for this new product, the parents started playing with it too. They started writing notes on the hangtags for their kids. Notes like - 'take the late 4:00 bus today' or 'bring gym clothes home tonight'. The parents were commenting that they could put the hangtag inside a lunch box or on a backpack in order to remind their kids of something or just as an expression of love. We hadn't even thought of the parents using it!" said Lauren Wilmot. Wilmot, who graduated from UVA in 2015, was awarded a $2,000 college scholarship from the local Chamber of Commerce for her business essay. "I cheered in high school and all 4 years at UVA. Cheerleading at UVA is very demanding because it is a 2 season sport and the ACC schedules are very rigorous. I learned a lot of time management skills. The whole idea for my company was rooted in my cheerleading experience. I wanted to provide kids, especially girls, with a positive way to express themselves to the world." MoodClue launched a one-month Kickstarter campaign on 1/11/18 and reached their fundraising goal in a little over 9 hours. "Though we reached our financial goal, the real impetus behind the campaign was to build a following for our product. We urge people to continue to support us and to continue to spread the word during the next month. We want to reach a really broad audience. The product has already been manufactured so there is no risk to supporting us," added Wilmot.